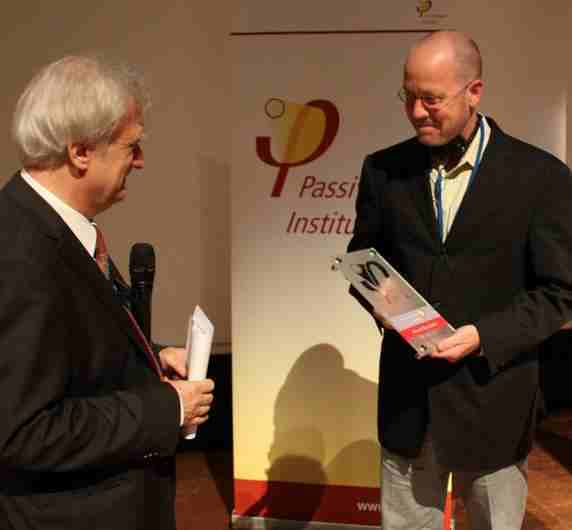 Wolfgang Feist (left), the director of the Passivhaus Institut in Germany, presented a building design award to Tim McDonald for the Belfield Homes development in Philadelphia. 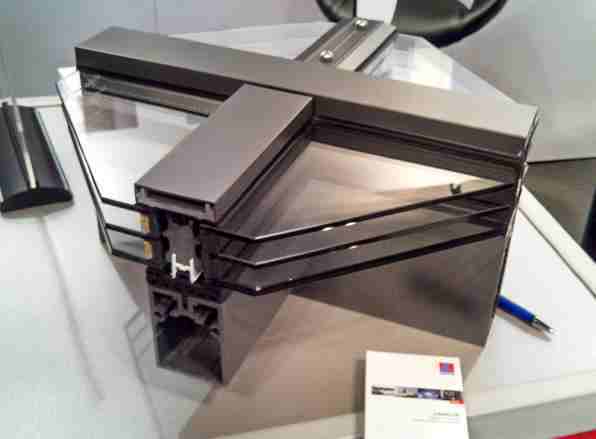 Image Credit: Image #1: Passivhaus Institut; all other images, Ken Levenson The aluminum in this curtain wall system from Kawneer (Alcoa Aluminum) has a 90% recycled content. 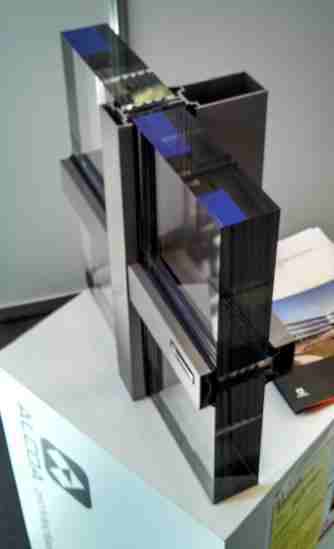 This curtain wall system is manufactured by Lamilux. Sto manufactures thermal-bridge-free façade anchors that have been certified by the Passivhaus Intitut. Unfortunately, Sto doesn't distribute the anchors in the United States. Smartwin manufactures Passivhaus-certified windows that are designed to be installed as retrofit units in historic buildings. The windows combine a thin-framed decorative single-glazed sash with a more typical single-lite tilt-turn Passivhaus sash. Greg Duncan, Julie Toress Moskovitz, and Bill Ryall. Nick Grant and Bjorn Kierulf. Attendees at the Aachen conference. 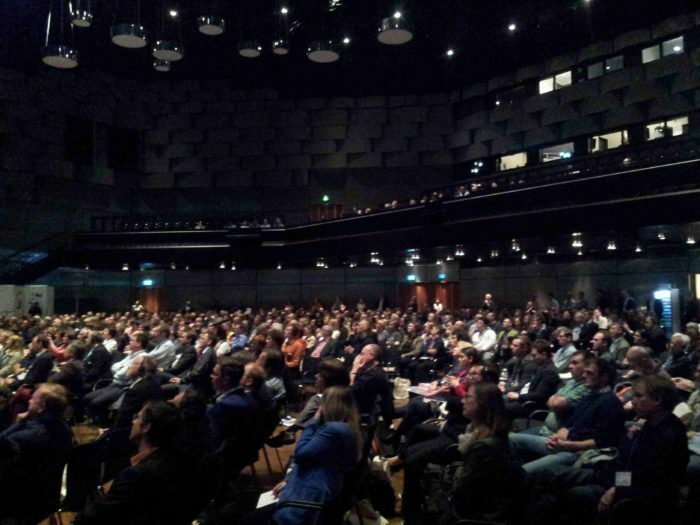 The 2014 International Passive House Conference was held in Aachen, Germany, on April 25-26. 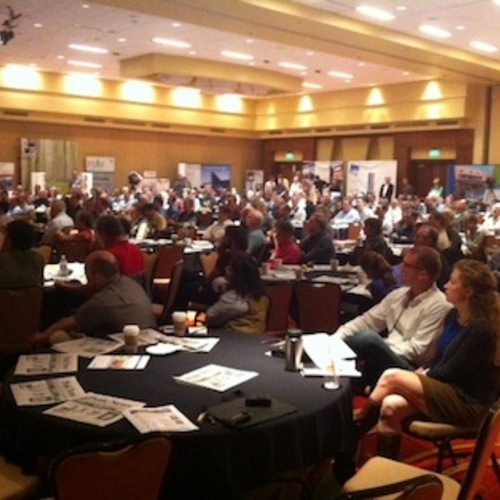 Produced by the Passivhaus Institut (PHI), this annual conference offered a dizzying and inspiring array of information and networking opportunities. PHI director Wolfgang Feist then gave a rousing opening talk, stating that “Passivhaus is more.” Feist described an ongoing development that focuses on energy, health, comfort, affordability, and design. Feist said that the key to affordability is accelerating the growth of Passivhaus training opportunities and marketplaces for Passivhaus-suitable components around the globe. Feist called for building designs that don’t just keep us comfortable, but inspire us. The building materials awards and the trade show demonstrated that there is a rapidly growing market for certified Passivhaus components and related building materials. At this point, PHI has certified 446 critical building components. 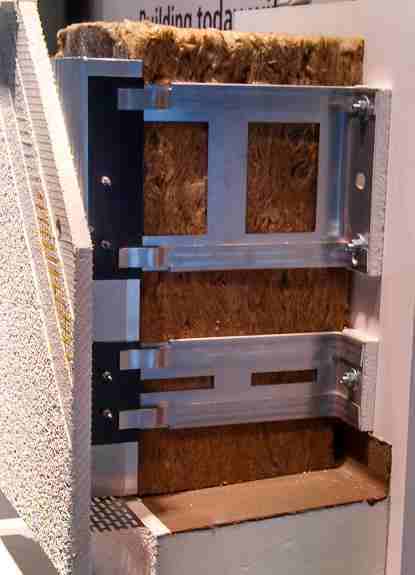 But of course many European building products are still unavailable in the U.S. On a the frustrating side of the ledger, Sto, a major supplier to the U.S. market, doesn’t appear to have plans to distribute its Passivhaus-certified thermal-bridge-free faÃ§ade anchors in the U.S. (see Image #4). I hereby make an open plea for Sto and Roxul (a leading provider of insulation for such outboard faÃ§ade systems) to work together and make these thermally broken support systems available in the U.S.
Also unavailable in the U.S.: the Passivhaus-certified “historic” windows by Smartwin. 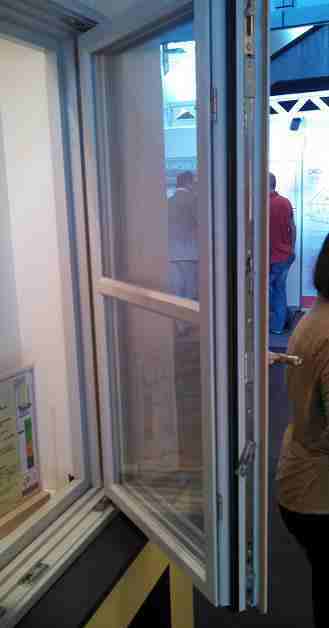 These windows ingeniously combine a thin-framed decorative single-glazed sash with a more typical single-lite tilt-turn Passivhaus sash (see Image #5). Buildings of many types, in many countries, received building design awards. Winners included a housing project in Finland and an educational building in South Korea. It was thrilling to have Julie Torres Moskovitz of New York City win an award for her Brooklyn townhouse retrofit, TightHouse. Tim McDonald won a single-family home award for the Belfield Homes development in Philadelphia. Bill Ryall was a finalist for his Orient Artist Studio on Long Island as well. Other winners included a gorgeous project by the powerhouse team of Rena and Gernot Vallentin for their Pulmone Health & Living Company seminar facility and apartment building in hot and humid South Korea. The first day of presentations included reports on regional-scale Passivhaus initiatives. Topics included Frankfurt’s ten-year history of public Passivhaus construction, Aachen’s city-wide initiative to collect energy data on all public buildings using a public web-based interface, and training programs for tradespeople and designers in the Aachen region. There were also presentations on retrofits, schools, ventilation components, design tools, EnerPHit, and challenging climates. 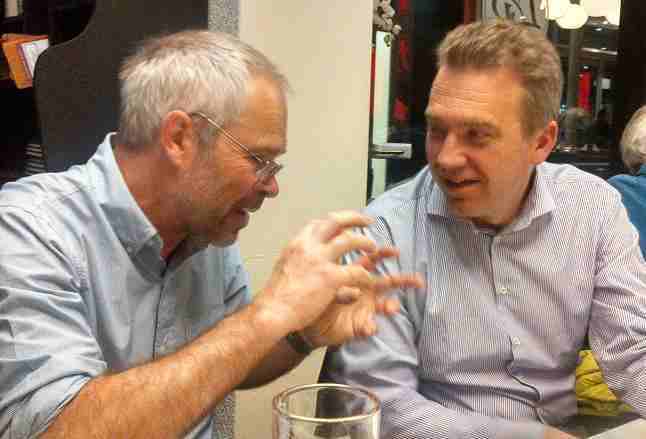 Discussions on retrofits were everywhere. Three entire session tracks were dedicated to the subject, and retrofits made many appearances in other tracks as well. One presentation discussed detailed technical studies on the interior insulation of massive walls. There was also a presentation on using post-occupancy data to validate the PHPP. Other presentations discussed how to specify windows for historic buildings and how to design decentralized ventilation systems. Tomas O’Leary of the Passive House Academy presented on the EnerPHit standard and the logic of performing incremental high quality improvements. Thomas Greindl of Sweco Architects gave a presentation on residential and school buildings in Sweden just 200 miles south of the Arctic Circle. Due to the extreme climate and to ensure quality control, scaffold tents are built first so that the building can be constructed “indoors.” Greindl explained that in such harsh conditions, single-family detached homes are an inefficient form, but duplex homes, row houses, and larger buildings like schools can readily achieve the Passivhaus standard. Rena Vallentin gave a presentation on the award-winning seminar facility and apartment building in South Korea. Preventing overheating and providing adequate dehumidification were key considerations in a climate that (while temperate) experiences hot and humid weather conditions. Long and sinewy, the forms are a synthesis of site considerations, materials choices, and program needs — an example of the type of complete architectural design that is rare in today’s siloed approach to information. Glass areas for dorm rooms face north, with south light entering a common area through carefully placed clerestories. There was a conference track dedicated to buildings with heavy internal loads, such as hospitals, supermarkets, swimming pools, and laboratories. PHI is now conducting research to develop strategies for optimizing the design of this type of building, where energy flows and specific demands can be quite complex. Researchers have discovered that the amount of energy required to keep swimming pool water warm is significantly less than initially predicted. 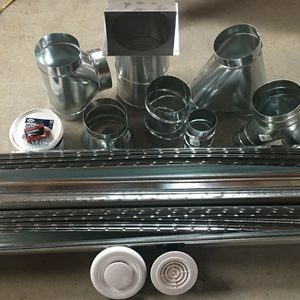 High-efficiency pool components are critical. Enormous energy savings can be realized by raising the humidity in the pool building and reducing the ventilation rates. A design tool for pool buildings is being developed by PHI to improve the methodology. The second day of the conference included discussions about integrated renewable energy systems, with a track on “nearly zero energy buildings” (NZEB) and energy-positive buildings. The issue is growing in importance, particularly because building codes will require NZEBs in European Union (EU) countries by 2021. For Passivhaus designers and consultants, there were useful seminars on the new DesignPH software that allows one to use SketchUp to create a model for preliminary suitability studies. The DesignPH software allows the SketchUp model to be integrated with the Passive House Planning Package (PHPP) spreadsheet. The software is loaded with default values and materials properties, so you can specify materials and easily customize the results, allowing fast visualization of the design and energy performance of the building. Another new initiative undertaken by PHI will allow independent software developers to provide a “front end” software plug-in to PHPP, so that PHPP users won’t have to look at endless spreadsheet pages (unless, of course, they are into that sort of thing). Maria del Carmen Rivero gave a presentation on PHI’s efforts to work with Mexican authorities to develop a market-specific PHPP for the production of low-energy-use social housing across the seven climate zones of Mexico. Finally, there was a presentation on PHI’s development of an online protocol to manage building certification submissions. When complete, the protocol will be used by accredited Passive House certifiers to simplify and streamline the certification process. The conference included a track dedicated to North American concerns. Adam Cohen presented his dormitory study, and Tim McDonald gave a presentation on his row house and multi-family approach. Also presenting were Jörg RÃ¼gemer of Park City, Utah, and Malcolm Isaacs of the Canadian Passive House Institute. Isaacs’ topic was the affordability of Passivhaus in cold climates. Matthew O’Malia of GO Logic discussed the spectacular Warren Woods Field Station & Laboratory that GO Logic is now completing in Michigan. 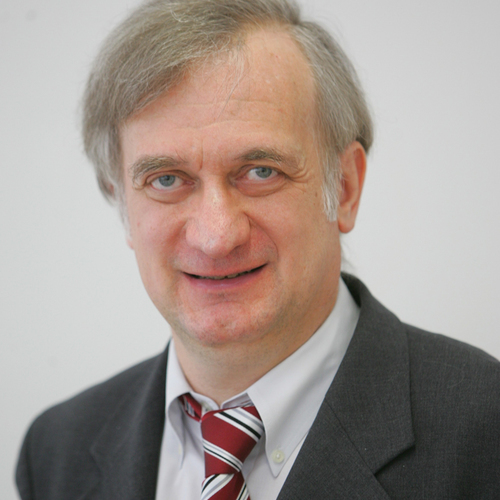 In his closing remarks, Wolfgang Feist addressed the need for a new method for calculating primary energy demand that incorporates an accounting of the growing and varied nature of renewable energy systems and energy storage systems. The intent is to encourage a fair calculation of the environmental impacts of these systems. He provided a calculation summary that produces a new Primary Renewable Energy (PRE) factor. The idea is that the new PRE allows for a more rational way to express a building’s energy balance and climate impact. Feist then explained that while the fundamental definition of a Passivhaus has been validated and will not be altered, it will be rebranded as “Passive House Classic,” and three new certification levels will be introduced to address criticisms and engage a larger future market. “Passive House Premium” will also mandate Passivhaus efficiency but will have a renewable energy system that is large enough to aim for the goal of an “energy positive” building. Because achieving NZEB or “energy positive” status is more difficult for a multistory building than it is for a single-family home, certification criteria will be based on the building’s footprint rather than the total floor area of the building. Second, to answer the critics who claim that Passivhaus is too ambitious and who want an easier standard, Feist offered not a softening of the Passivhaus metrics but a new lesser certification described as an “Energy Conservation Building.” An Energy Conservation Building would have an annual space heating demand that is up to twice as high as that of a Passive House Classic building. 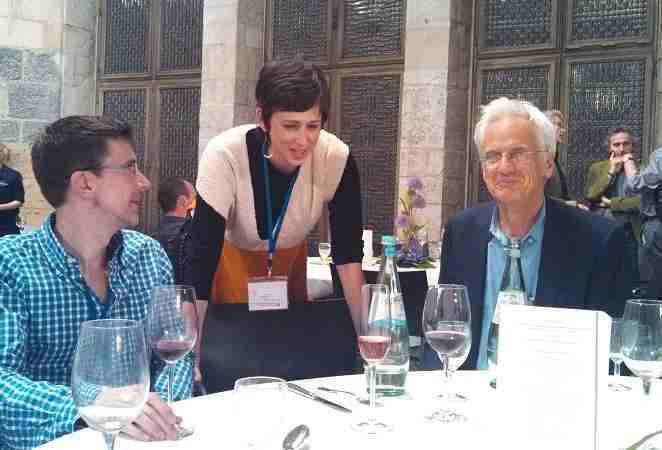 The North American Passive House Network dinner on Saturday night is an emerging tradition. 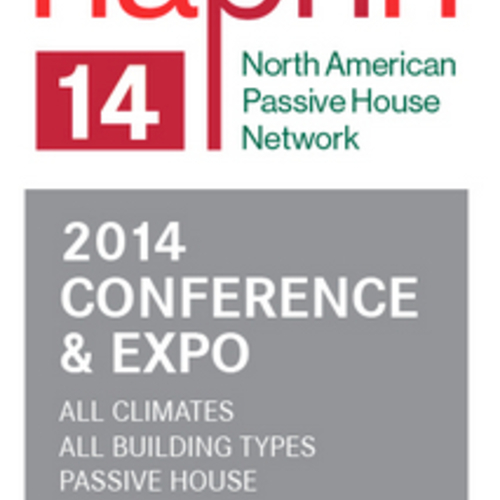 Practitioners from around the world gather, make new friends, and share Passivhaus stories. Andre Harrmann of the Canadian Passive House Institute made it happen this year, with an assist from Brownyn Barry of Passive House California. There were 50 attendees — significantly more than the original RSVP list of 30 people — including GÃ¼nter Lang, Nick Grant, Mark Siddall, and Bjorn Kierulf. It was a great way to unwind (see Image #7). Sunday was a day of touring nearby Passivhaus buildings and and low-energy buildings. On my tour I had the good fortune to visit the amazing St. Leonhard cafeteria and classroom building by PBS Architects of Aachen. It is a medium-sized building (approximately 9,000 square feet) and three stories tall. Its most defining feature is a reflective all-glass faÃ§ade which stands as a literal mirror to the historic church across the plaza. Incredibly, the glass faÃ§ade is the north faÃ§ade! And while it didn’t achieve 15 kWh/m2•year, you may be surprised to learn that it could have; it clocks in at 18 kWh/m2•year. It turns out that the project’s mandate wasn’t to meet the Passivhaus standard but instead the Aachen standard. We all looked at each other, puzzled: the Aachen standard? 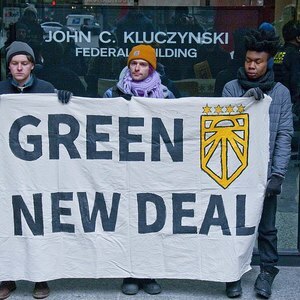 It was explained that when developing their new local building energy codes the officials wanted to be aggressive; they wanted to use the Passivhaus House standard (defined by 15 kWh/m2•year), but the political situation wouldn’t allow it. Instead they were able to achieve a standard of 20 kWh/m2•year, now known as the Aachen standard. Gregoire Clerfayt of Brussels in his conference presentation also described the pushback from real estate and construction industry interests when developing Passivhaus building codes that will go into effect next year. Politicians in Brussels also came to a political compromise. Mr. Clerfayt explained that the 0.6 ach50 airtightness requirement will be phased in, starting at 1.0 ach50 in 2015 and dropping 0.1 each year, reaching 0.6 in 2019. What’s interesting is that they are not trying to change the Passivhaus standard. They are providing a regional adaptation given the local political realities. The Passivhaus definition remains unchanged. 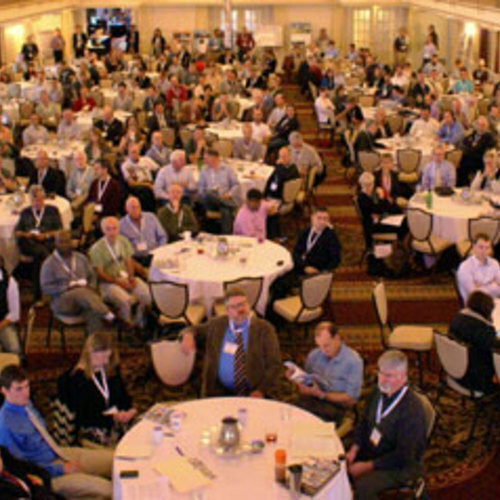 My conference experience still had one more event: the annual International Passive House Association (iPHA) Affiliates Council meeting on Sunday evening. With affiliates from 17 countries, including two from the U.S. (New York Passive House and Passive House California), it was a striking reaffirmation of the global nature of our common effort. We shared reports from each region and discussed the next steps for building a dynamic organization — learning the interesting fact that some of the fastest growth was coming from such economically distressed areas as Spain, Italy, and Greece. It was a hopeful note to end on. I hope to see you at next year’s conference in Leipzig, Germany. Ken Levenson is a Certified Passive House Designer, President of New York Passive House, a founder of the North American Passive House Network and a partner at (475 High Performance Building Supply. The new designations are very funny - especially the "Energy Conservation Building", to appease their critics. 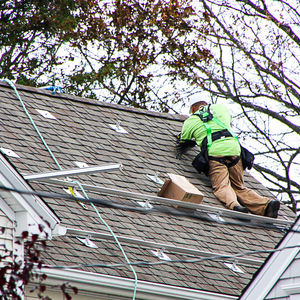 Why not call it "Passive House Lite"? We should invent a drinking game where you have to think up new possible variants. Why do you charge so much for the Lunos e2 fans? Because they cost so much - and we'd prefer not to lose money each time we make a sale. To me the Lunos e-go design is the future of ventilation, for various reasons. What sort of quantity would you need to trigger a reasonable discount? Could they be licensed to be assembled in the US? Yes - we agree and are very excited about the future. Certainly we expect that with larger quantities the prices will come down significantly. Even today, if one were to buy 10 pair, or 50 pair or 100 pair - significant savings can be achieved at each level.....it's a numbers "game". Of course they could be assembled in the US eventually, and we sincerely hope a lot of the products we currently import will one day be made in the US - but I don't think the cost driver is so much in the assembly or shipping, more in the manufacture of the very particularly made ceramic core and other component parts. Thanks for this comprehensive and informative write-up, Ken. 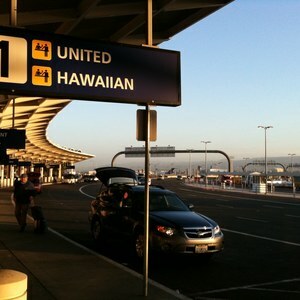 Sorry I couldn't meet up with you at the conference. Sounds like it was a whirlwind!